Is Aquarium Close to a Fireplace Good Feng Shui? Question: Is an aquarium next to the fireplace in the living room good feng shui? Answer: First, let me ask you a question: do you think it is good feng shui to have an aquarium close to the fireplace in your living room? How does this setup look and feel to you even if you did not know anything about feng shui? How do you feel the energy of an aquarium as compared to the energy of the fireplace? To answer this question first look around your living room and see how all the decor elements in the living room interact. Is there a sense of balance in your living room? An inviting, welcoming energy? Good colors, cozy decor elements? In making any feng shui decisions about specific feng shui cures, first always decide if it makes sense to you visually, as well as practically. Will having an aquarium close to the fireplace weaken the fireplace role as a focal point of the living room? Will it create a sense of visual clutter or imbalance? 1. The interaction of the feng shui elements of the aquarium and the fireplace. 2. 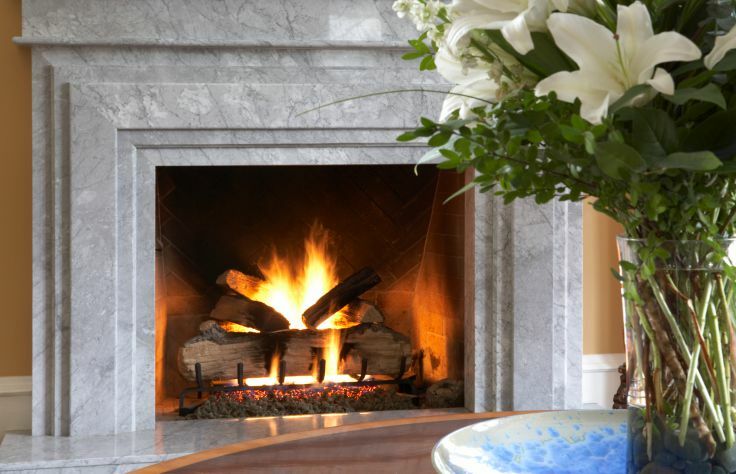 The feng shui bagua area of your living room fireplace location. Ask yourself: how do the feng shui elements of the items in question interact? It is helpful to understand the basics of the productive and destructive cycles of feng shui elements in order to make these decisions. Do you need a stronger fire element in this specific feng shui bagua area or is it more water feng shui element energy that this feng shui bagua area needs? Feng shui fire element (the fireplace) and the feng shui water element (the aquarium) create strong energy together that can often lead to a restless quality of energy, or the energy of conflict. Think of this interaction in simple, practical terms: how do water and fire interact? Next, which area of the bagua is your fireplace located? If it is in an area that welcomes the fire feng shui element, such as Southwest, for example, or South, then the water element of the aquarium will only weaken the feng shui energy needed in the area. However, if your fireplace is located in a feng shui area where the fire element is not desired, such as East feng shui area, for example, then the water feng shui element of the aquarium might be welcomed in your living room decor. The aquarium usually represents more elements than just the water element, all depending on its design, as well as the number and type of fish. A well-designed aquarium can be a potent feng shui cure for wealth, and, as such, it is best used in the feng shui money area. You can use specific fish to make the feng shui power of your aquarium more potent. In conclusion, be sure to experiment and sense for yourself what is the best placement of items in your living room, as each room has its own voice, energy and feeling.